You certainly have a few of your favorite plants in your garden or on the balcony, which should be removed as soon as possible because of their toxicity, especially if you have small children and pets, because you cannot completely control their movement. 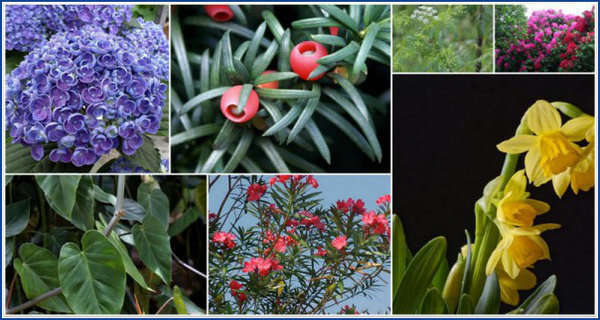 It may happen out of curiosity, someone to try some of the plants, which can be very dangerous. The symptoms of poisoning from these plants are not harmless at all. This wonderful plant is a perfect decoration for your yard. Be very careful with eating its flower, stem and leaves, since it can cause a dangerous poisoning. The main symptoms of poisoning are abdominal pain, difficulty in breathing, paralysis, coma and even death. Oleander blooms in white, pink and red. It looks beautiful and the kids often pickits flowers. However, a single leaf can poison the child. The symptoms of poisoning include fever, slowed heartbeat and dizziness. This flower may appear in your garden as weeds. If you have pets, be sure to get rid of it. The poison of hemlock smells like carrots and attracts pets. If consumed directly, it attacks the nervous system. Also, in both animals and humans, it causes epilepsy and even death. In yellow narcissus, its bulb is the most poisonous part. Even though it looks beautifully, think twice before you plant it. If you suspect that your pet has eaten it, immediately go to the vet. Symptoms after eating yellow narcissus are diarrhea, vomiting, fever, cramps and arrhythmias. In this plant the most toxic parts are its seeds. However, no less toxic are its other parts. Alkaloids found in this plant can cause convulsions, paralysis, and in the worst case, even cessation of the heart. This beautiful flower contains very dangerous poison, cyanide. However, you should not worry too much about it. Humans and animals need to eat large quantities of this flower for it to harm them. However, we should not risk it. Fluids that this flower contains can irritate the skin and the oral cavity. It may cause difficult breathing, swelling of the throat and stomach problems. Although some dangerous reactions are very rare, it would be wise not to keep this plant at home If you have small children or pets.